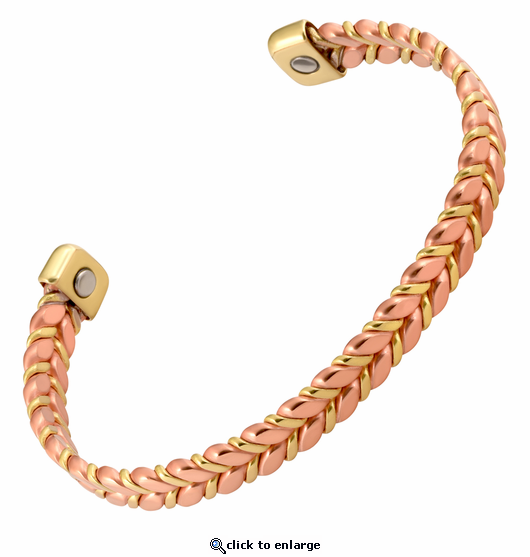 This is a unique and finely crafted chevron design copper magnetic bracelet. This therapy bracelet is made with only solid metals made from pure copper and no color plating. Beautifully crafted in pure copper and brass(85% copper), it has 2 powerful 3000 gauss neodymium rare earth bio north facing magnets and stainless steel magnet caps for added durability. This nickel free copper magnetic bracelet is a bit wider than 1/3" wide.